@DataRemixed Down a rabbit hole looking for a @tableau web data connector for google trends/correlate data. Is there an easy option? This part was totally straightforward. 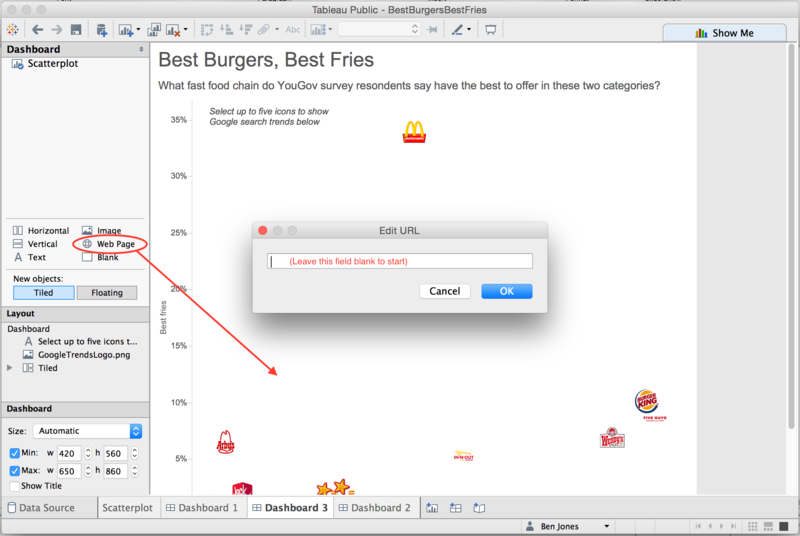 I created a basic Excel table out of YouGov survey results where respondents said which restaurant had the best burgers and which had the best fries. 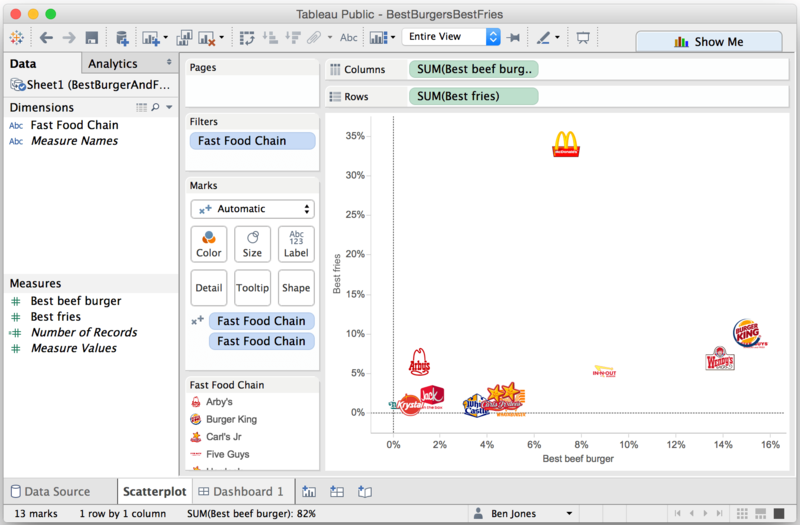 Then I dragged “Best beef burger” to the Columns shelf and “Best fries” to the Rows shelf, adding the fast food logos by dragging “Fast Food Chain” to Shape and making sure I had a folder with the logo png files inside my Documents/My Tableau Repository/Shapes folder. Easy. Now that the Web Page object is out on the dashboard, I can control which website gets shown inside the box by creating a URL Dashboard Action. 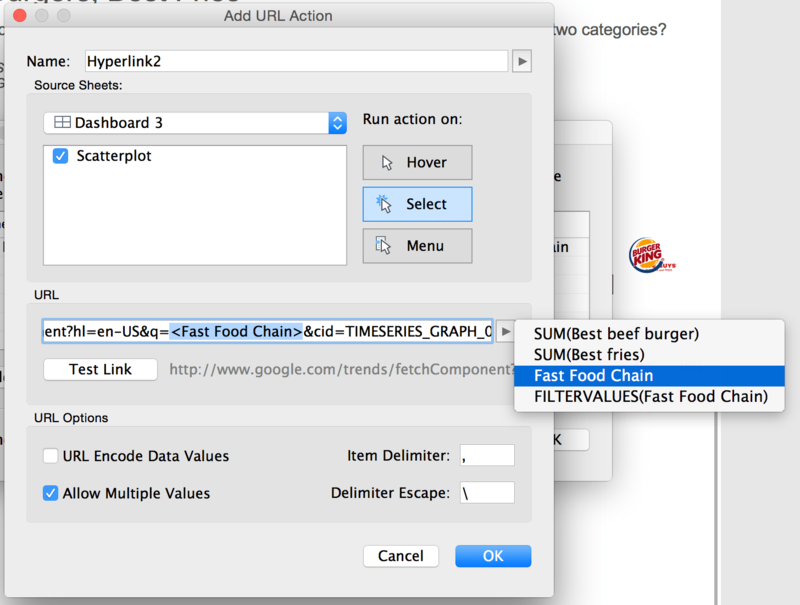 To do so, click Dashboard > Action > Add Action > URL. That’s it! A word of caution: Google Trends seems to have a search quota, so you might hit your limit like I did when creating this dashboard and trying different things, hitting the trends site from the same IP address over and over. The good news is if you want a couple hours, you should be good to go again. At least that’s how it was for me. I think this tip could be taken to a whole different level by embedding Google Trends maps, or searching within countries, etc. All you’d need to do is figure out how Google Trends controls these parameters by looking at the URL that it creates when you do a search. Okay, thanks for reading. I hope this was helpful to you. Let me know if you find a way to improve on it! Fun solution, I really like it!